I have neglected my blog and my art studio for the past few months. I have been pouring all of my creative energy into directing a show at my local, community theater. My husband and I helped to start a community theater in our small town nearly 40 years ago. Since it began I have directed over 17 different productions. My last show was "1776" 14 years ago. I really had moved on and didn't think I would ever direct a show there again - for lots of reasons. Last spring a former student and the current president of the community theater came to visit my husband and I in our high school classrooms and pleaded for us to come back and do another show. It's impossible to say no to a former student. We said yes. So for the past year, we have been planning, designing and calling in favors to create a production of "Man of La Mancha." "Man of La Mancha" is a huge production and tells the story of Don Quixote. I have loved this show for over 30 years (lots of nostalgic dates in this post) so it was the show I most wanted to build. I cast the production back in November and started building the set and costumes right away. This is one of the first dictionary pages I have created since starting the show. I am using it as a Thank You gift for my cast and crew. I loved this dictionary page with its many references to Don Quixote. I selected the word "Quixotic" to feature. 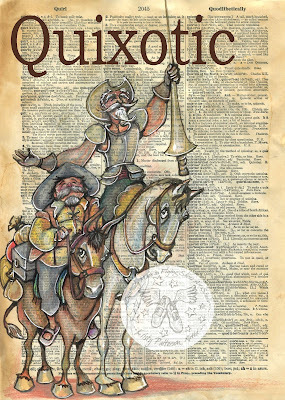 Quixotic (strangely pronounced kwix-otic) is being Quixote-like and having lofty schemes, visionary, idealistic. These are all the characteristics and attributes I love about this particular musical. 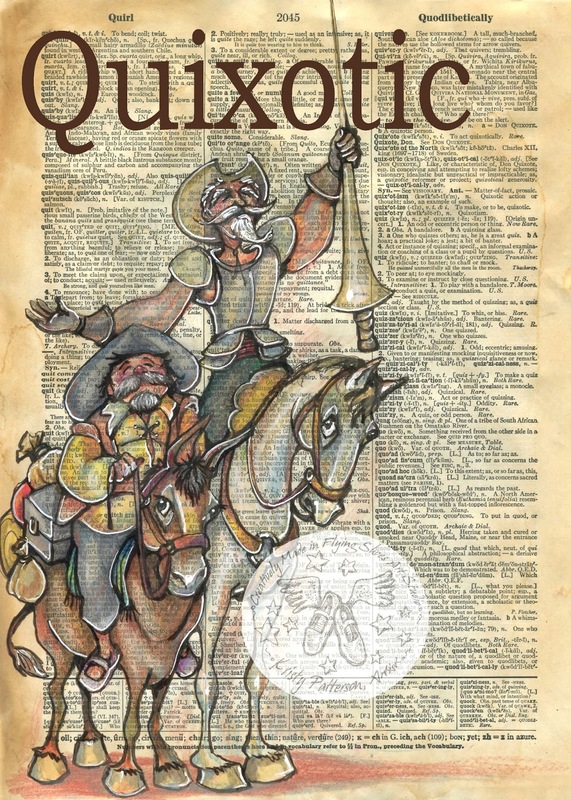 I think we could all use some Quixotic effects in our lives. I had a great time creating my own versions of the visionary, madman Quixote and his always faithful squire, Sancho Panza. So glad to see you back on the blog, your Quixotic page is wonderful. I have seen a community theater show or two when i lived in Guymon, bet this one was super! You are such an asset to that community. Thanks for posting, it was a good blast from the past for me too. Love, love, love it. But then I love all your work.